Introduction: Duplication of the alimentary tract is an uncommon occurrence (1 of 4500 births) in pediatric patients and can affect any portion of the gastrointestinal track. The esophagus and ileum are most common site, and gastric duplication cysts represent 4-8% of all alimentary track. Symptoms often occur by 2 years and can include nausea, vomiting, hematemesis, and vague abdominal pain. Occasionally, a palpable abdominal mass may be identified on physical examination and such lesions can occasionally lead to perforation as well. They are typically found on the greater curvature or posterior stomach wall, more commonly cystic than tubular, and although they are attached to the stomach, they do not typically communicate with the lumen. The treatment of choice is surgical resection. The following is a description of 8-years-old male with gastric duplication cyst treated by laparoscopic gastric partial resection. Case: An 8-year–old boy who has intermittent upper abdominal pain visited our hospital because of acute on set pain in the lower abdominal region. According to CT, acute appendicitis was detected with suspicion of gastric duplication, laparoscopic appendectomy was performed first. After the recovery from appendectomy, we evaluated the suspected gastric lesion on CT. From upper gastro-intestinal study, communicating form of gastric duplication where gastric great curvature was detected and laparoscopic partial gastric resection was performed. In operative field, chronic inflammation of the stomach resulted the severe adhesion between stomach great curvature and the surrounding tissues. The suspected area of gastric duplication can be viewed with unaided eyes and also be identified by touch sensation with laparoscopic instrument. We performed partial gastrectomy with the attachment of normal gastric tissue by linear stapler. Results: The pathologic report confirmed gastric duplication. The patient was able to eat two days after the surgery, and was discharged after 5 days without any particular complications. 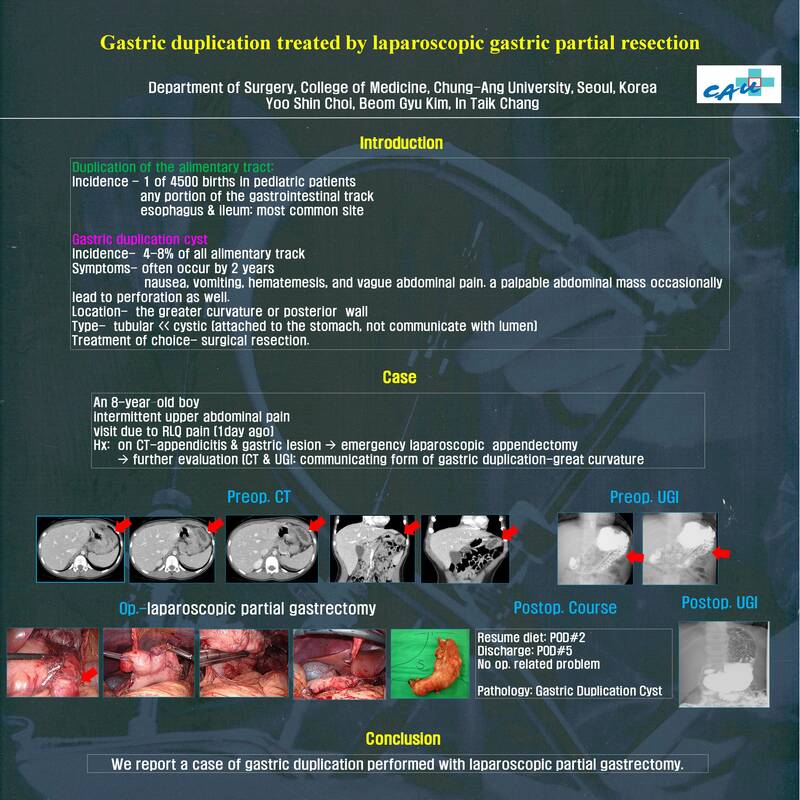 Conclusion: We report a case of gastric duplication performed with laparoscopic partial gastrectomy.